Above: Vicki Leopold interviews Sarah Kalins with sign language. Sarah Kalins, 29, is my neighbor, my friend and my inspiration. Sometimes life, being life, gets difficult, and I am just too tired or too bothered. Then I think of Sarah, and I plow on. 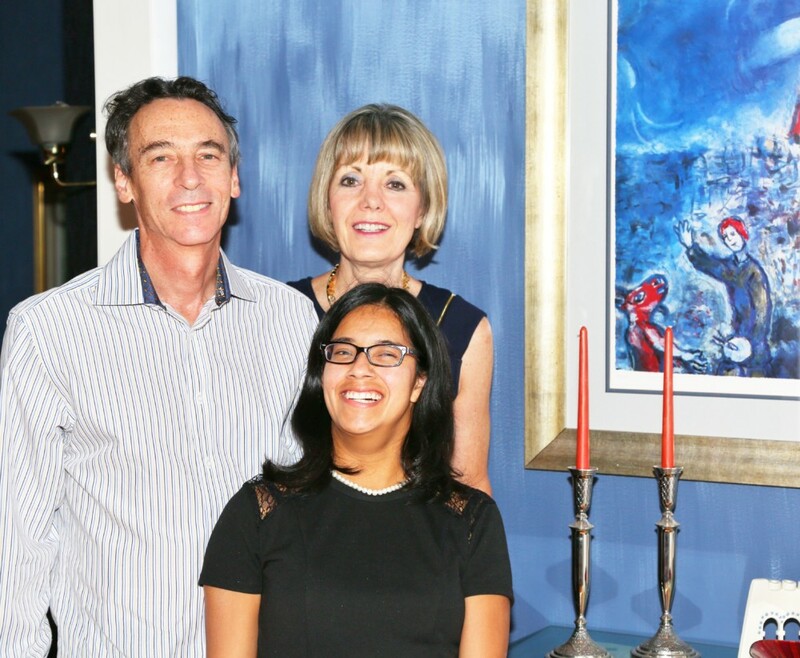 Sarah Kalins enjoys Shabbat with parents Jeff and Karen. Sarah was born in El Salvador. She was adopted by Karen and Jeff Kalins at age 4 months, weighing 9 pounds, failing and ill. The Kalinses know little of her background except that she was born premature and suffered from oxygen deprivation at birth and was thought to be both deaf and blind. After reading her chart, a pediatrician advised the Kalinses against adopting the tiny girl, but Jeff and Karen persisted. 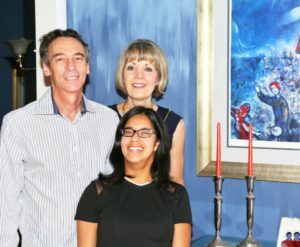 Sarah became the couple’s second adopted child. They had adopted a son, Ethan, also from El Salvador. When Sarah was 9 months old, the Kalinses adopted another girl, this time from Georgia. Sarah was so small that she looked the same size as their younger daughter, Rachel. Karen laughs that people would ask whether her Hispanic-looking daughter and her Caucasian-looking daughter were twins. Her answer: Yes, but from different dads. Little Sarah ran down the hall with the walker. 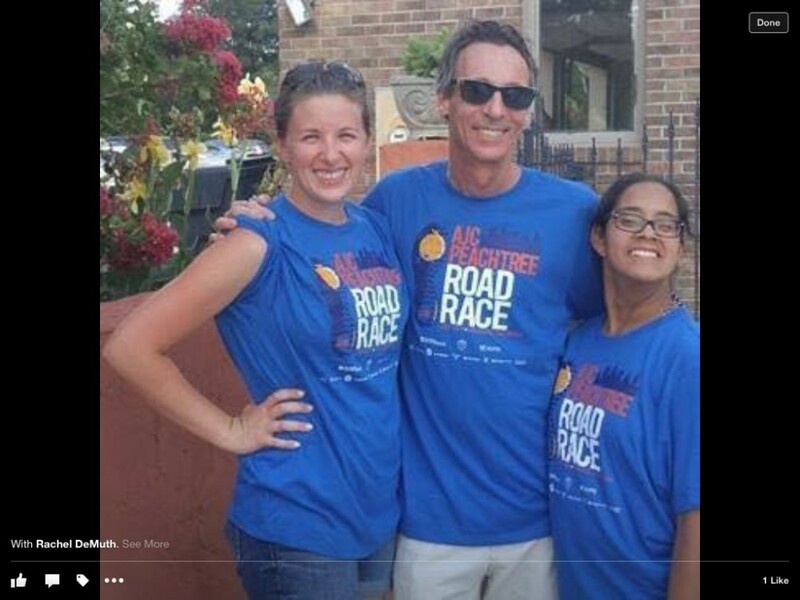 Sarah Kalins attends this year’s Peachtree Road Race with her sister, special education teacher Rachel DeMuth, and their father, Jeff Kalins. “So much for the wheelchair,” Karen said. Starting at age 4, Sarah rode a bus every school day an hour and a half from Fayetteville to Atlanta to attend the Atlanta Area School for the Deaf. She made that trip from 1991 until 2007. After school, Sarah attended a vocational program called Reach that had recently begun in Fayette County. She was the first person hired from the program. She began her part-time job in 2008 at Zaxby’s in Fayetteville. On Friday nights at Congregation B’nai Israel, Sarah can usually be found giving congregants hugs and thumbs-up. She is animated, well-groomed, kind and helpful. Her smile is warm and welcoming. She pitches in to help with onegs and waves to everyone she knows. She loves to laugh and joke and enjoys people watching. Several months ago Zaxby’s awarded Sarah an Employee of the Year commendation for outstanding work. When her dad announced the news at B’nai Israel, the whole congregation clapped, and Sarah beamed. Asked to reflect on being Jewish, Sarah said she loves it. She loves the holidays, the synagogue and the people. She loves challah, latkes, and bagels and lox. She is always concerned about and committed to Israel. While she has not traveled to Israel, Sarah explained in sign language that she hopes to make the trip one day. 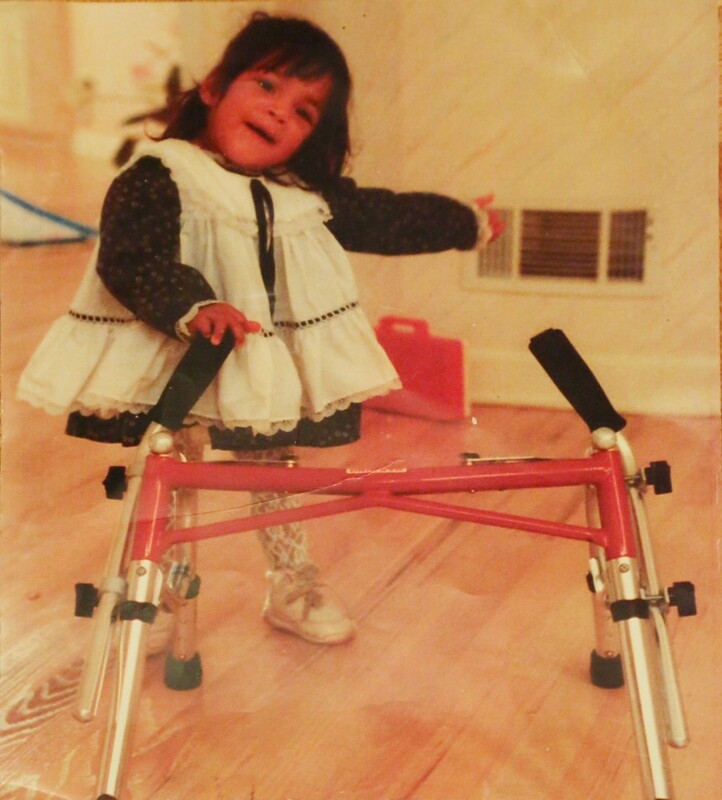 When a physical therapist suggested a wheelchair for Sarah around age 18 months, her mother decided to try a walker first, and Sarah took off. Sarah and her parents visit the synagogues in each country they visit, and she is amazed at how beautiful and big some of them are. The most beautiful one she has seen is in Florence. Sarah also has traveled to France, Ireland twice, Spain, Scotland, Mexico, and her homeland, El Salvador, twice. During this interview in the summer, Sarah was preparing for a trip to Sweden, Denmark and Russia and had researched a synagogue in Copenhagen she wanted her parents to visit. Sarah also has enjoyed Jewish events in Atlanta, including the Jewish Film Festival, Chabad challah bakes and trips to the Breman Museum. Sarah especially enjoyed the film festival when it showed a movie about deaf Israeli high school students. It was easy for her to follow the story. While Sarah enjoys and participates in all the holidays, her favorite is Chanukah because her family gets together and invites friends over to celebrate with good food and gifts. Her two little nephews come over, and her mother makes latkes from scratch. While Sarah is proud of being Jewish, she also takes pride in being a descendant of the Maya. She said she has a particular birthmark on her back that is typical only of the Maya. Her parents took her to El Salvador when she and her sister and brother were young. They traveled with other children adopted from there. She saw volcanoes and Mayan ruins and remembers that the people were short, like her. 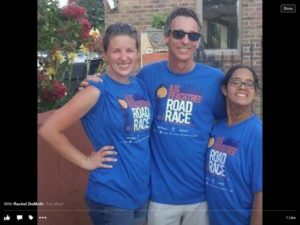 In addition to traveling, socializing and working, Sarah makes time for volunteer work. She helps the teachers of young children at Fayetteville’s Joseph Sams School, which serves children with intellectual, physical or developmental challenges. She said it is hard work because some of the children are difficult with lots of behavioral problems. She stays focused and patient and is happy that she can help. Jeff and Karen are proud of Sarah’s computer skills and research abilities, which she uses to learn about people and places. Like many young adults, Sarah uses social media to socialize, especially with other deaf people. She attends “Deaf Night” in Fayette County and Atlanta, during which adults meet and mingle. Sarah has met men online, but what she would like is to meet a nice Jewish deaf guy. Anyone know anybody?